The workers at JCG Farms are exclusively family members, Jose runs farm operations. 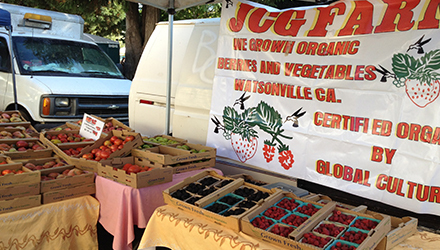 Jose and Berenice Garcia are the proud owners of JCG Farm, a 5-acre organic plot in Watsonville. Jose worked in the ﬁelds in Watsonville for 10 years before starting JCG farms in the year 2000 in partnership with his wife Berenice. The farm was certified organic by Global Culture in 2005 and continues to operate as an organic farm today. JCG Farms produces a diversity of fruits and vegetables that is rare to ﬁnd in this country on any single farm, small or large. JCG has a reputation for both their beautiful produce and their delicious prepared foods, a variety of typical Mexican dishes that highlight the freshness of their produce and are sold under the Garcia Family name at local farmers' markets. Berenice loves to cook and it shows in her creative specialties such as strawberry tamales. You can visit them at various local markets including, Watsonville, Live Oak, Downtown Santa Cruz, Westside Santa Cruz, Marina and Pacific Grove. Garcia says he chose to convert his business to organic practices because it was difficult to enter the local markets as a small conventional grower. Berenice, is also very passionate about growing organically because of the health beneﬁts and because it is the lineage that she and Jose come from in Michoacan, Mexico, where their grandparents farmed organically long before these methods had a name. No pest management methods have been used, all operations are natural. JCG Farms relies on a well that provides abundant water. By using drip irrigation the farm manages to distribute enough water to the vegetables and berries. Combating it manually, cultivating frequently with a tractor, plastic covering, flame or fire. JCG has a reputation for both their beautiful produce and their delicious prepared foods, a variety of typical Mexican dishes that highlight the freshness of their produce and are sold under the Garcia Family name at local farmers' markets. Berenice loves to cook and it shows in her creative specialties such as strawberry tamales. You can visit them at various local markets including, Watsonville, Live Oak, Downtown Santa Cruz, Westside, Santa Cruz, Marina and Paciﬁc Grove.